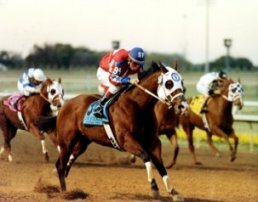 The Downs at Albuquerque hosts live horse racing during the season and enjoys plenty of simulcast horse racing and wagering coverage year round. It has a fun, laid back atmosphere and offers plenty of great gambling-orientated entertainment. The track at The Downs is roughly one mile in length and oval in shape. The final, homerun stretch measures approximately 1,114 ft in length and has proved to provide plenty of excitement during racing season. The Downs has year-round simulcast horse racing and wagering which focuses on the country's biggest and best horse races. Hundreds of TVs make it possible for you to enjoy the race from anywhere in the clubhouse. The Downs also features plenty of slot machines, video games, blackjack and even a poker machine. All the games are very popular and add plenty of excitement to the average night spent at The Downs. Once you've worked up an appetite you can head off to the Paddock Grill or the Jockey Club where you can find anything from quick light meals to professionally prepared culinary delights. You'll find The Downs at the Expo New Mexico State Fairgrounds in Albuquerque. The gambling facilities are most easily reached through Gate 3 so start making your plans for a night on the town now.